Home Tags Posts tagged with "Fort Greene"
Now that spring is here, you know that sooner or later you’ll find yourself in a beer hall of some kind. And after the first pint, you’ll inevitably want to grab a bite, if only to make yourself thirsty enough for the next round. Currywurst is exactly what you need. It goes great with beer, and the spicy sausage together with salty fries will make you long for another mug. 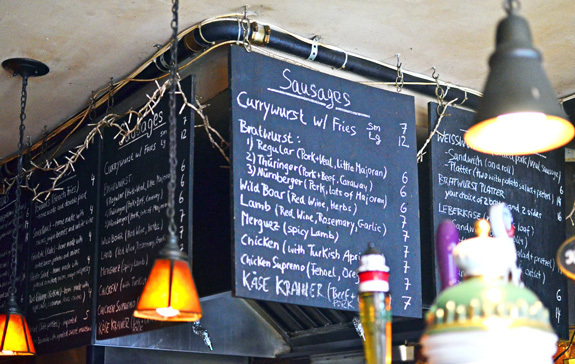 I’ve found four German joints in New York that feature currywurst on their menus. This post won’t really have restaurant reviews, since I’m only focusing on that one dish. All of these establishments are indoors, but what better way to spend a hot summer afternoon than inside an air-conditioned beer hall?